Teaching has always played an integral role in my life, and I’ve been fortunate to have had a range of teachers who believed in me, motivated me and inspired me. I wanted a career where my education was never going to stop and, in teaching, you’re always learning, especially from your pupils. Becoming a leader has enabled me to extend my influence and to apply, at whole school level, the values and priorities I have honed throughout my career. As a head you can influence how the team operates and it is an honour to have the opportunity to support a school to develop in a way that permeates your own vision and values. 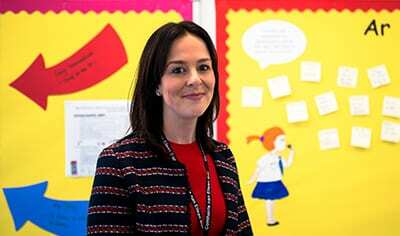 I worked my way from a probationary teacher to class teacher, to acting Deputy Head at Condorrat Primary School, where I was given the opportunity to develop my skills in leading, managing and providing strategic direction to colleagues. Teaching has enhanced my leadership qualities significantly; each year has brought new classes and colleagues who continually inspire my commitment to education. My dedication to implementing change and motivating staff and pupils has resulted in a leadership post in a second school, so I currently am Headteacher of both Sgoil Bhaile a’ Mhanaich and Sgoil an Iochdair. As a headteacher you need an understanding of what makes people tick and by getting the team dynamics right, everything else follows quite naturally.